As the title, I have an existing table which is already populated with 150000 records. I have added an Id column (which is currently null). I'm assuming I can run a query to fill this column with incremental numbers, and then set as primary key and turn on auto increment. Is this the correct way to proceed? And if so, how do I fill the initial numbers? You can't "turn on" the IDENTITY: it's a table rebuild. If you don't care about the number order, you'd add the column, NOT NULL, with IDENTITY in one go. 150k rows isn't a lot. If you need to preserve some number order, then add the numbers accordingly. 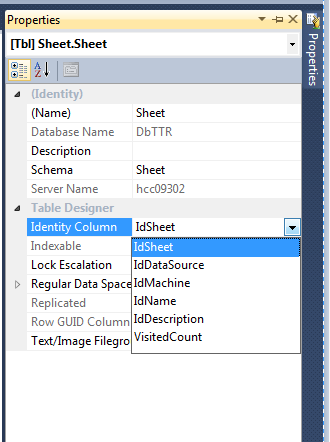 Then use the SSMS table designer to set the IDENTITY property. This allows you to generate a script which will do the column drop/add/keep numbers/reseed for you. When we add and identity column in an existing table it will automatically populate no need to populate it manually. If your table has relationship with other tables using its primary or foriegen key, may be it is impossible to alter your table. so you need to drop and create the table again. To solve these problems you need to Generate Scripts by right click on the database and in advanced option set type of data to script to scheme and data. 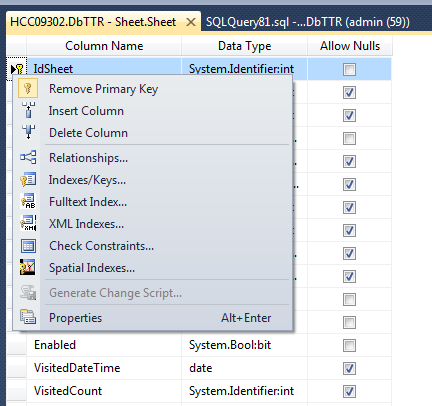 after that, using this script with the changing your column to identify and regenerate the table using run its query. Here is an idea you can try. Original table - no identity column table1 create a new table - call table2 along with identity column. copy the data from table1 to table2 - the identity column is populated automatically with auto incremented numbers. rename the original table - table1 to table3 rename the new table - table2 to table1 (original table) Now you have the table1 with identity column included and populated for the existing data. after making sure there is no issue and working properly, drop the table3 when no longer needed. Create a new Table With Different name and same columns, Primary Key and Foreign Key association and link this in your Insert statement of code. For E.g : For EMPLOYEE, replace with EMPLOYEES. However, you have to either delete the existing EMPLOYEE Table or do some adjustment according to your requirement. This answer is a small addition to the highest voted answer and works for SQL Server. The question requested an auto increment primary key, the current answer does add the primary key, but it is not flagged as auto-increment. The script below checks for the columns, existence, and adds it with the autoincrement flag enabled. I have not tested this at all, so be careful! No need for another table. This simply inserts an id column, makes it the primary index, and populates it with sequential values. If SQL Server won't do this, my apologies for wasting your time. Not the answer you're looking for? Browse other questions tagged sql-server sql-server-2008 primary-key alter-table or ask your own question. How do I add a auto_increment primary key in SQL Server database? SQL Server, How to set auto increment after creating a table without data loss?